Growing up I was never a big fan of pizza, I was always turned off from the bland look, the pools of oil that leaked from the hot cheese, and the thick and chewy crust. It wasn’t until recently when pictures of gourmet pizzas started flooding my computer screen did it pique my interest. The colours, the nicely arranged toppings, the thin and crispy looking crust! I have finally ventured into the pizza world and let me tell you it is damn fine! Lucky for me, Kevin loves pizza. When we aren’t making pizza ourselves When we are too lazy to make pizza ourselves, we usually order Papa John’s Favourite thin crust… which typically results in the stacks of pizza boxes by the back door. 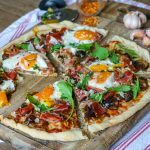 Oh gosh, now I sound like a hypocrite – yes, this isn’t the gourmet pizza I was talking about earlier, but the flavours and the cracker-style crust is just amazing! Now this recipe isn’t going to be a copycat of Papa John’s, no not at all! This recipe is a result of my recent pizza night FOMO (feeling of missing out) experience. I thought what would be better than pizza night? 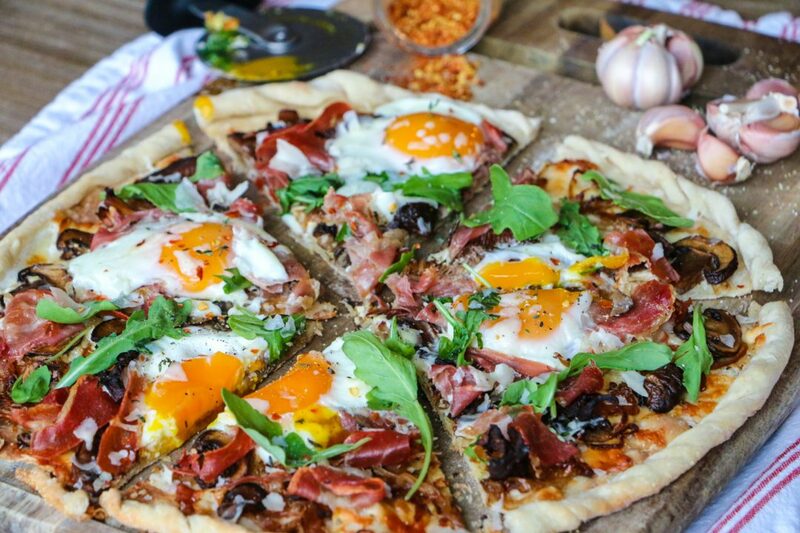 Breakfast pizza! 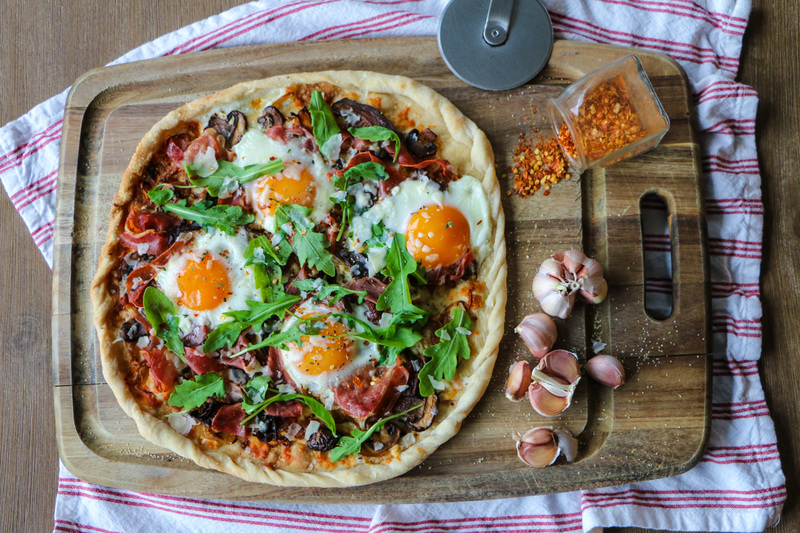 Pizza with soft baked, ooey-gooey runny yolks. First I want to make a comment – if you do not have a pizza stone, you can simply use a cookie sheet that is lined with parchment paper. If you choose this method, you can shape the pizza dough into a rectangle so it fits better on the cookie sheet. Also, you do not have to heat up the cookie sheet in the oven prior to cooking. Caramelized are my favourite, I kind of wish I had made a huge batch for later use. I had used white onions, as I had those on hand, but feel free to use yellow or red. Yellow onions have a bit more sugar in them which will help with the caramelization. Red onions will produce a deep purple/red colour which is nice for presentation. When you are cooking the onions make sure you have a large pan. The more surface area, the better! You don’t want the onions to be crowded, this will result in them steaming rather than getting that beautiful brown colour! Caramelizing onions takes a lot of patience… so don’t be quick to turn up the heat to speed up the process, you’d probably end up burning them! You need to let the onions sweat, this process breaks down the cell structure resulting in moisture release and eventually the sugars being released. It’s not uncommon to add a pinch of sugar to the “help” with the caramelization process, but I don’t think it’s necessary the onions itself will be able to caramelize nicely. For the mushroom, use whatever kind you like. I had a bag of mixed forest mushrooms which I had reconstituted and added to some brown button mushroom. Let these bad boys sauté until they get nice and brown. I always add cornmeal to my pizza paddle as this help the pizza dough slide off the paddle easily. Just remember to wipe off the corn meal from the paddle after you have transferred the pizza to the stone. I don’t know how many times I have forgotten to do this and ended up with cornmeal all over the kitchen floor. I forgot today… Kevin was nice enough to help me vacuum it all up though. He’s a gem. 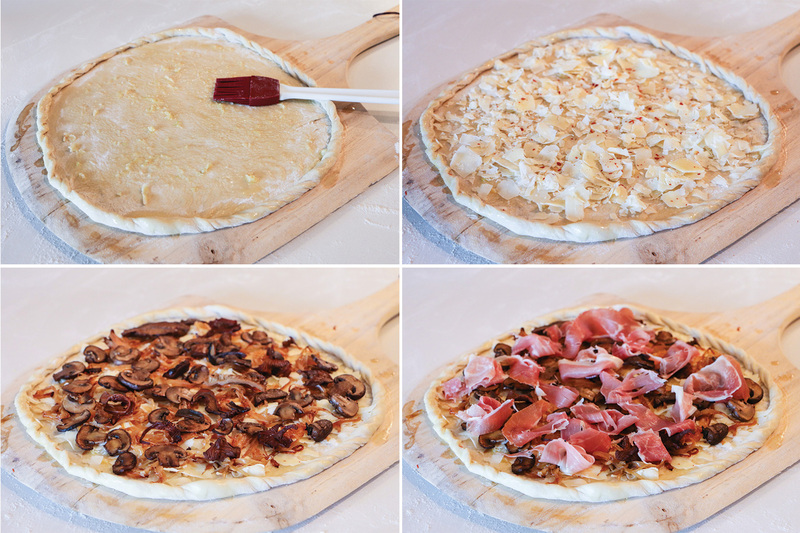 To build the pizza, brush on some of the garlic butter, toss on some cheese, chili flakes and the remaining toppings. My only one regret is that I didn’t have enough Parmesan to put on. I had forgotten to pick up some ricotta the day earlier, but thought I had a full container of Parmesan still in the fridge… Lemme say, living with a guy means foods like cheese do not last long… the struggle is real guys. The bake time isn’t long at all, since the oven is so hot (500 F) the pizza dough only really needs 8-10 minutes to bake. Which is enough time for the crust to get nicely browned and for the eggs to be soft baked! The prosciutto should be nicely crisped as well and swimming in a sea of melted cheese. When the pizza is done baking, garnish with some arugula and fresh herbs. I decided to add the arugula after baking because I wanted them to retain their nice crisp profile. I also added WAYYY more arugula after I finished taking pictures of the pizza. I love arugula, I can’t have enough of it. 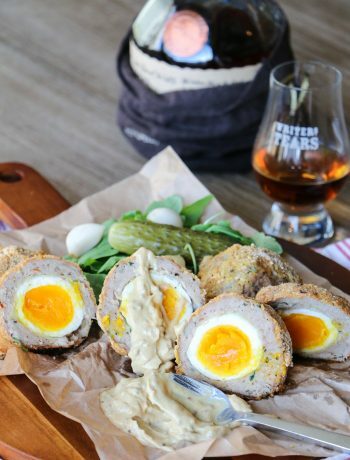 Tired of the same old weekend breakfast of eggs and toast? 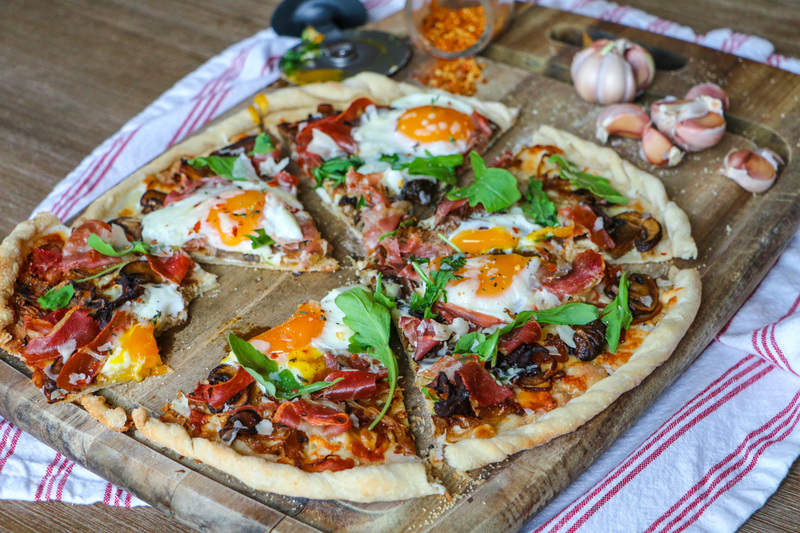 This spin on a typical dinner style pizza is perfect for those late weekend breakfasts. 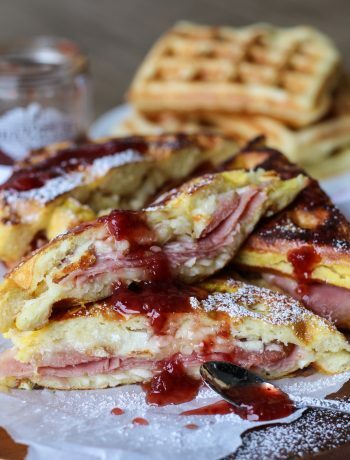 Crispy, cheesy, eggy, and fresh! This ain't no cold pizza leftover! Place the pizza stone on the middle-top rack and preheat to 500 F.
Grate 1 clove of garlic into 2 Tbs of softened butter and salt to taste. This will be used to brush the pizza dough. Heat 2 large sauté pans to medium heat and coat both pans with a mixture of olive oil and butter. When the pans are hot, add the onions to one of the pans and the mushrooms to the other. 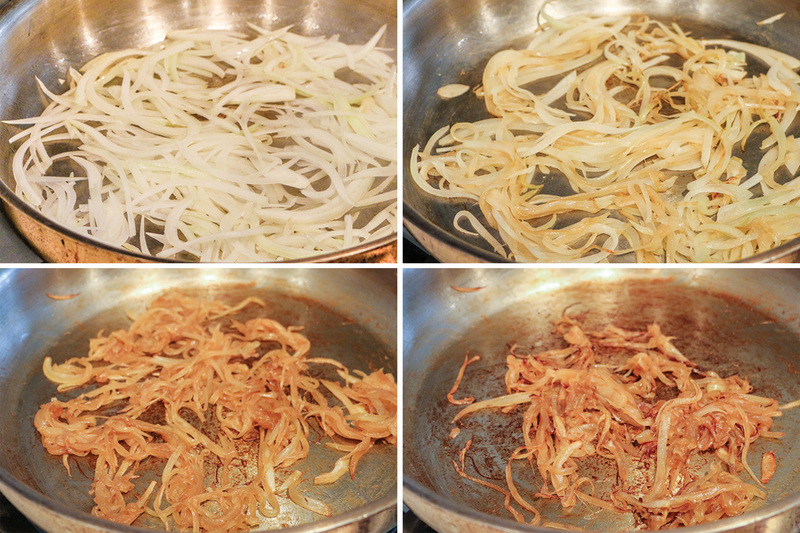 For the caramelized onions, coat the onions in the butter/oil mixture and spread the onions evenly in the pan. Stir the onions occasionally, every 5 mins or so to make sure the onions are evenly cooked. If the onions start looking “dried out” you can add a little bit of water to moisten the onions. Midway through cooking, salt to taste. Depending on your stove, you may need to turn down the heat so the onions don’t burn. When the onions have achieved the dark brown caramelized look and taste (after about 25 mins of total cooking time), remove the pan from the heat. 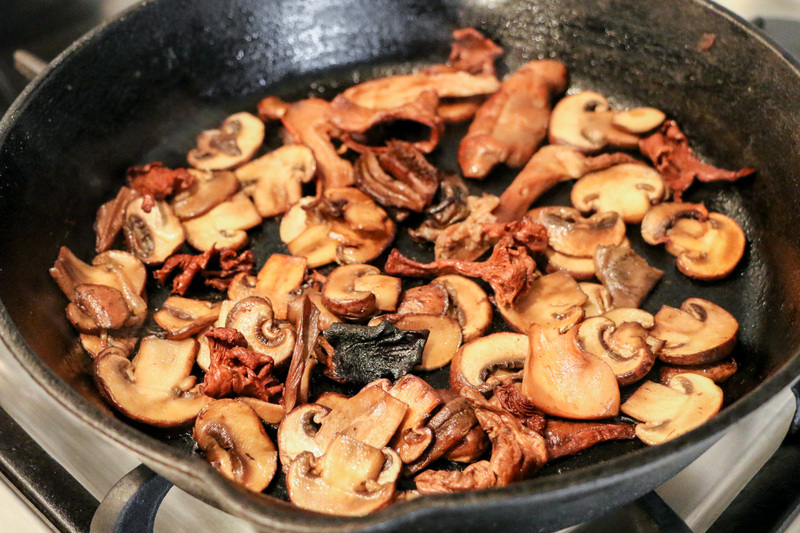 For the sautéed mushrooms, coat the mushrooms in the butter/oil mixture and spread the mushrooms evenly in the pan. Stir frequently. Salt and pepper to taste. The mushrooms should sauté for a total of 25 mins until it develops a nice brown colour. When done, remove the pan from the heat. For the pizza dough, dust your countertop with flour and roll out the pizza dough until very thin. The dough should be as big as the pizza paddle (mine was 12 inches). Lightly sprinkle enough cornmeal to cover the surface of the pizza paddle, then carefully fold the pizza dough in half and transfer the dough on to the paddle. If you want, you can make a crust by folding the edge of the dough over. Brush the entire pizza dough and crust with the garlic butter. Add a generous amount of Parmesan (you can also add ricotta or fresh mozzarella). Sprinkle a little bit of red chili flakes over top. Spread the caramelized onions and sautéed mushrooms evenly on the pizza. Tear the prosciutto strips into smaller strips and drape evenly on the pizza. Crack 3-4 eggs onto the pizza (make sure they are evenly placed or you’ll have one very unhappy person). With oven mitts, pull out the rack with the pizza stone on it halfway (make sure it is securely stationed) and carefully slide the pizza off the paddle (without letting the eggs slide off) and onto the pizza stone. Slide the rack back into the oven. 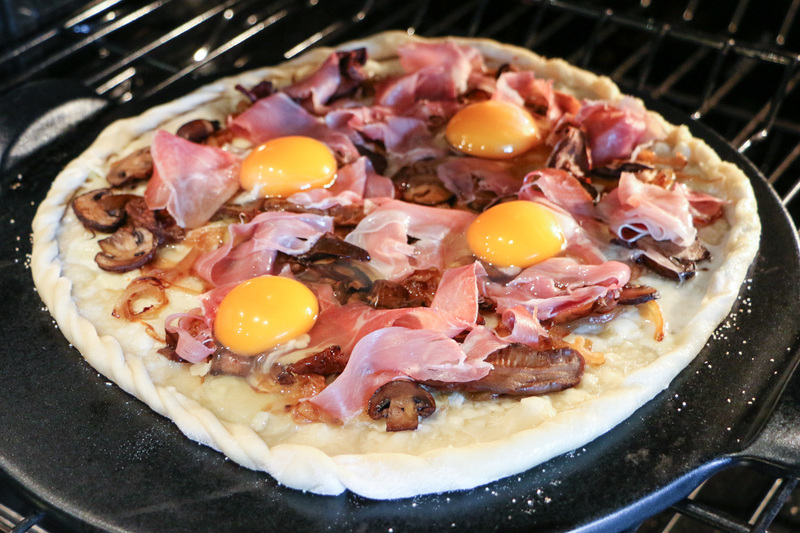 Bake for 8-10 mins, until the crust is nicely browned, the crispy prosciutto is swimming in a sea of melted cheese, and the eggs are soft and jiggly. Remove the pizza from the oven and garnish with a handful of arugula, fresh thyme and oregano (or your fresh herbs of choice), cracked pepper, and more Parmesan. 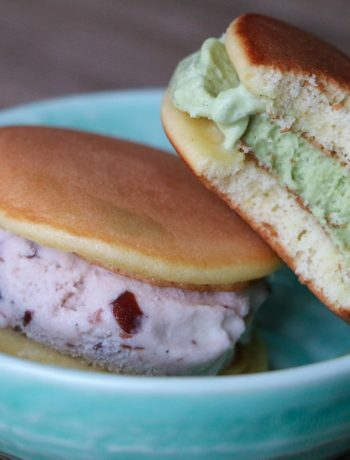 Cut into sliced and enjoy!